All the useful information that you need to know before sending money with Azimo! Established in the year 2012, Azimo transfer offers money transfer services to people over 190 countries in 80 different currencies. The company has approximately 50 million customers connected to its platform which offers more than 300,000 cash pick-up locations globally. Azimo money transfer provides comparable real-time exchange rates, and charges noticeably lower than those most banks charge to process overseas fund transfers. Azimo charges competitive exchange service fees from its users which range in between absolutely FREE to GBP 12, depending on the mode and country you are sending money to. The maximum amount that one can transfer from Azimo is different for a private transfer and business transfer. In private transfer, one can transfer up to GBP 10,000 on a daily basis with a minimum transfer of GBP 50. While in the business transfer, one can transfer up to GBP 250,000 or equivalent daily with no yearly maximum limit. The company also provides an option to its customers to donate a part of their money to charity while processing the funds. It has been providing best security to its customer where experts detect any unusual activities 24/7 so that one can transfer without any fear of privacy. Pricing : How much does Azimo cost? As one of the major online transferring platforms across the world, Azimo offers better exchange rates than many of the banks. It keeps updating the exchange rates as per market fluctuations and aligns to global markets. You can check the exchange rate and fees while processing the transfer after entering all the necessary details. However, the fee which you have to pay depends on various factors such as the currency you wish to pay in, the transfer amount, the payment method, and the transfer method. However, it is offering lower rates than many of its competitors and banks. Transparency: Does Azimo have any hidden fees? Azimo is very much transparent with its fees and exchange rate. There are no hidden fees when you send money on Azimo. The exchange rate will get locked once the customer starts his transaction. At the same time, it will also provide the transfer fees when you select the way of transfer. So, you will be able to see the whole updated amount you have to pay for the transfer clearly on the screen, and you have not to pay a single penny more. After the completion of the transaction, it also provides the time the funds will be going to take to the recipient. Most of its transfer takes place instantly or in 1-2 working days, depending on the banks and country you are sending money. It also provides the email confirmation of the transfer to its customers. 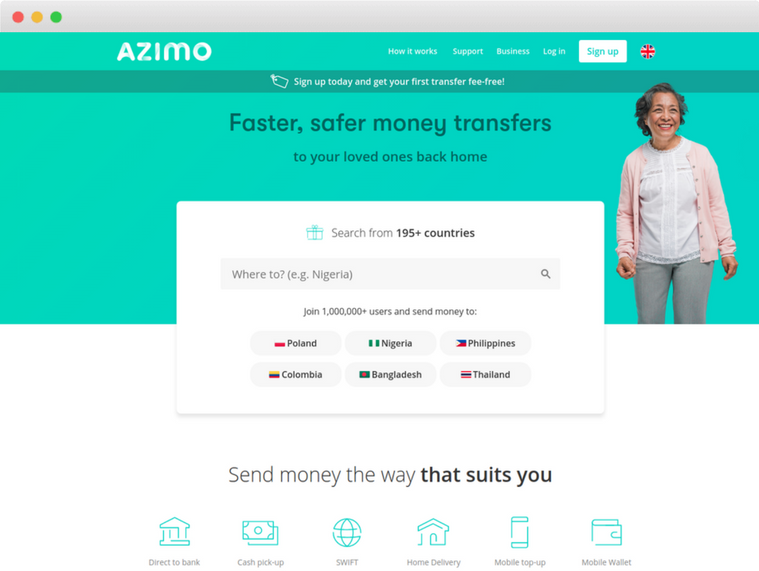 Transfer Speed: How long does it take to send money through Azimo? Security : Is Azimo Safe? Privacy is one of the significant things that one afraid of when they are transacting online, and it is more important is the age of cyber crimes. So, you should be happy to know that Azimo scans its systems 24/7 to detect any unusual activity. It uses high levels of encryption to keep the transmission of data secure. Azimo mobile apps and website uses Verified by Visa and MasterCard SecureCode to make sure it processes legitimate orders. Besides this, the company has been authorised with the UK Financial Conduct Authority (FCA). It has been regulated and licensed by Her Majesty’s Revenue & Customs (HMRC). So, by using the best technical and human resources, it is saving the data of its clients. We believe that it has been providing enough security to protect the data of customers and hence, it deserves 10 out of 10. Azimo is one of the best money remittance companies, but it does not provide over-the-phone assistance to its customers. This needs improvement as people only can send a message to the company regarding their issues and there is no other way to contact them. Besides this, Azimo money remittance is a highly responsive website as you will get the exchange rates and service fee in zero clicks, once you enter the details. It has also provided its mobile apps which are highly secured. You can download Azimo app here (Android App and iOS App). You need not to login to Azimo for knowing the exchange rates and service fee. You can check all the details of transfer without signing up or login. Users can send money through the bank account, SWIFT payment, MasterCard, Visa debit and credit cards. The company is also providing the services of cash pick-ups and airtime top-ups. However, those who hold crypto currencies, money market securities and any other card could not use the services of Azimo. So, as per user experience, we rate 7 out of 10 to Azimo money transfer customer services and user experience. We would have given higher ratings to the company, but its customers are not enough satisfied with its assistance services and payment modes. Coverage: How many Countries & Currencies does Azimo support? One can send money from Azimo in various currencies and countries through the bank, debit card and credit card without any yearly maximum limit. So, if you also want to send the money through Azimo login here. It has still many countries and currencies to cover. Azimo is a recent entrant in the remittance industry, and we can see many growth opportunities for the company. I send money through Azimo since on the 15/04/19 up till now the recipient hasn't received the cash in the account yet. Azimo send me an update the next day that the money has been delivered to the account but still the money isnt in yet. I emailed Azimo 3 days later, up till now I still haven't received any reply from them or contact yet. I am very upset as the purpose of the money wasn't been able to be used for. A friend recommended me to Azimo, but so far, it's a terrible experience, and would never recommend anyone to this company. Great service but exchange rate is low. Your services are very poor and does not meet business standards. I believe you have a bunch of people with no business skill. You need to understand that there is competition everywhere and for someone to patronize you, you have to be good .l mean very good which you are not. First of all you cannot be contacted when there's an issue.How can l be sending money through people l cannt reach. The last time l sent 50 pounds , you took 5 pounds as commission without any warning. I do not trust you. I sent money home this Easter but wouldn't use u again . It is very stressful. This is UK and not third world country. It was fast and safe. Exchange rate should be worked on. Select the country you want to send money through Azimo. You’ll be redirected to a new page, here enter the amount you want to send. It will show the exact amount that is received by the recipient. It will also show if you can do a direct bank transfer. Click on “Send” after entering the amount. Here you need to login or sign up. Enter all your personal details if you are signing up for the first time. Re-check all the details and send. You will get all the confirmation details on your registered email ID and mobile through SMS. You can note that the first two transfers through Azimo are absolutely FREE and you need not to pay any fee for it.